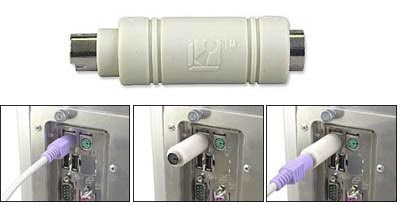 If you are using a public terminal in an internet cafe, college library or even inside the posh business center of an hotel or airport lounge, do check the connection between your keyboard cable and the desktop - the white AA battery sized hardware device in the picture is actually a keystroke logger. Hardware keyloggers may soon become a challenge in schools and offices as these devices get affordable and widely available. These deceptive KeyGhost hardware keyloggers plug-in between your keyboard and Desktop PC and will largely go unnoticed by the computer user. Once plugged in, it tracks and records all computer keystrokes in it's internal Flash memory. The keystrokes can later be retrieved using any text editor.